Most of the people who know me or meet me regularly, notice I wear a ponytail really often. I realised, I actually haven’t made any outfit posts with it. This one is just everything I love about everyday clothing. I’ve had these Top shop wedges for quite some time now and I just can’t say goodbye, because they are so comfortable. 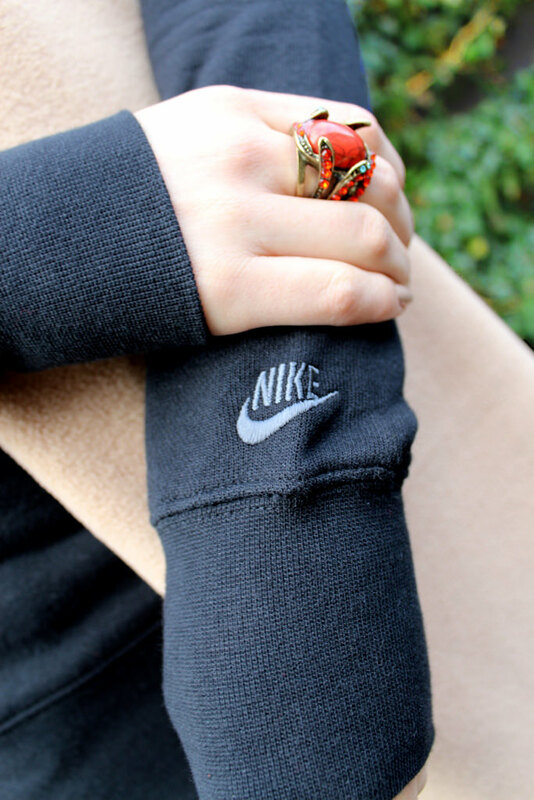 This Nike sweater with lamb leather details is something the “Nike Santa” got me for Christmas (as mentioned before, I am an ambassador of Nike and I was really good last year). The jeans are something special with the different colored sides; black in the front and jeans blue in the back. I spiced the outfit with red lipcolor and vintage ring. All you need to add is a simple warm scarf and you’re ready to go! I loke this look, my dear! Have a good time, my dear! wonderful photos and you look very pretty my dear. you are lucky to be one of those girls who looks so pulled together with a pony tail.i look so stupid with one unfortunately. I swear every time I look at one of your posts I love your style even more. I am a pony tail girl too! sweetie u look stuning in every post as always!! CHICNOVA JEWELRY GIVEAWAY – 3 lucky winners to be chosen on my blog. You look stunning in that first image!